GRP has the versatility and appearance to look fantastic in a range of domestic applications, including extensions, garages, dormer roofs, parapet walls, gulleys, gutters, conservatories, orangeries and many more. 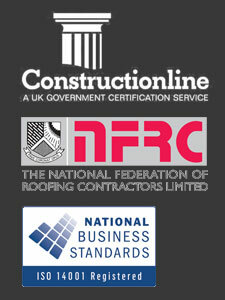 Ask your Leatherhead GRP roofer for more information. Whether it’s a large-scale specialist project or walls, walkways or casements, a GRP roofer can provide the perfect solution for your industrial or commercial building in Leatherhead, even for the trickiest specifications. GRP is often used as a long-lasting replacement or alternative for lead or copper for roofs, gutter linings and architectural detail. It can even be used for listed buildings. Just ask your Leatherhead roofer for more details about the uses of GRP. A Leatherhead GRP roofer can provide the extra level of performance and waterproof protection you need for balconies, walkways and stairs. Balustrade supports, tiles or decking can also be easily incorporated into the system. GRP can be used to create green roofs, which can support grass or wildflowers growing on top. As well as creating natural beauty, this can add sound insulation and deliver energy savings for your Leatherhead property.